The Victorian period was a prosperous time for the British and they spared no expense when it came to decorating, especially during Christmas. With a “more is more” attitude, the decorations were romantic, rich, ornate and lavish and covered every inch of the Christmas tree. Modern-day Victorian-style ornaments are just as lavish and frequently have price tags to match. You can get the same look for a lot less, if you make your own. 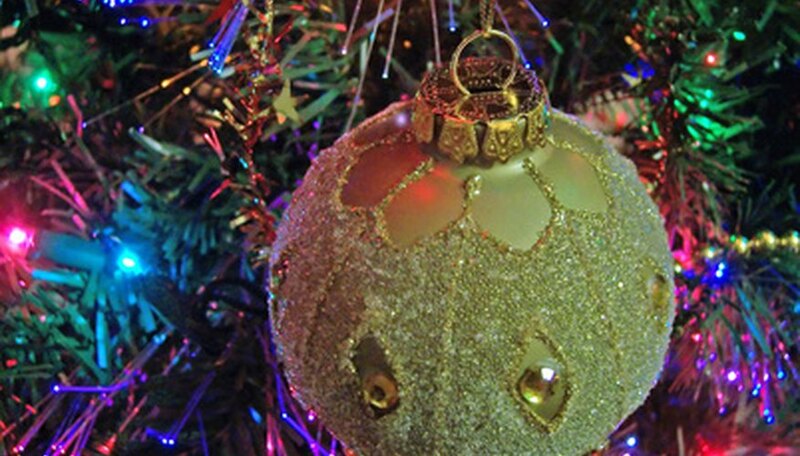 Check your Christmas stash for marred or barely used clear and colored ornaments. Any shape, size and texture will do but smooth, ball-shaped ornaments have a wider work surface and their exteriors make them easier to decorate. Also, look for inexpensive ornaments at discount and dollar stores. Look for craft items, paints and embellishments in mauve, lavender, cream, white, burgundy, sage green, dusty blue and gold. Victorian colors are typically muted but are still rich, deep and vibrant and contrast beautifully with the delicate pastels. Choose the adornments. Victorian Christmas ornaments are fussy, detailed and feminine. Shop a fabric or craft store for ribbon, bows, lace, decorative cording, tassels and tulle and browse the fabric aisle for floral, paisley, satin and velvet. Pick up miniature bird nests, birds and butterflies, along with silk and dried flowers. Stock up on feathers, glitter, beads and sequins. Check your jewelry box for cameos, charms and pendants. Marbleize the ornaments. Slowly pour acrylic paints through the tops of glass Christmas ornaments and swirl. Use two or three colors to get a marble effect. Try a pearl paint for extra shine. Hang with matching ribbon. Pour gold, silver or pearl seed beads in clear glass ornaments. Top with a matching bows. Fill clear glass ornaments with potpourri, feathers or curling ribbon. Cut sheet music into 3-inch lengths, approximately ½-inch narrower than the diameter of the glass ball. Roll them up with the music facing outward and insert through the top. Top with a pretty ribbon, silk flower or miniature musical instrument ornament. Create simple designs on glass Christmas ornaments with glitter and glue. Using the glue bottle tip like a pencil, draw snowflakes, stars, flowers, butterflies, bells, hearts, dots and scrolls. Sprinkle glitter or tiny seed beads on the designs. Attach matching hangers. Make faux sugar fruit ornaments. Cover glass ornaments with white glue or spray adhesive. Dye granulated sugar with food coloring to make cherries, apples, oranges and blueberries. Glue on miniature silk leaves and hang with green ribbon. Give light sparkle to plain or decorated glass Christmas ornaments with glitter spray. Cover glass Christmas ornaments in Victorian-inspired fabric. Choose two or three patterns and cut in small pieces. Glue on piece by piece, overlapping each piece as you go. Let dry and glue on decorative roping or randomly attach pearls or rhinestones. Top with a silk flower, small grape cluster or lace bow. Decoupage Victorian-inspired magazine photos and wrapping paper onto glass ornaments. Search for pictures of cats, dolls and flowers. Attach pictures with decoupage medium and let dry. Brush two or three coats of medium on finished ornaments for extra shine and durability. Loosely wrap glass Christmas tree ornaments with tulle or lace and tie with ribbon. Attach a silk flower and baby’s-breath. Cover glass ornaments with feathers or miniature silk flowers and hang with matching ribbon. Cover the workspace to protect from spills and hot glue. Attach ornament hooks and hang wet ornaments on a clothesline to dry or set each ornament on top of a foam cup. Work in sections and let each section dry before moving on to the next. Set the glue gun on a low setting to prevent ornaments from cracking. Shop garage sales, thrift stores, dollar stores and after-Christmas sales for the best deals. Lisa Gregor has been writing off and on for 40-plus years. She has been writing how-to articles for eHow since January 2009 and on her blog LadyLip.com. She is working on two children's books, a fiction novel and has plans to write a series of budget (frugal living) books.